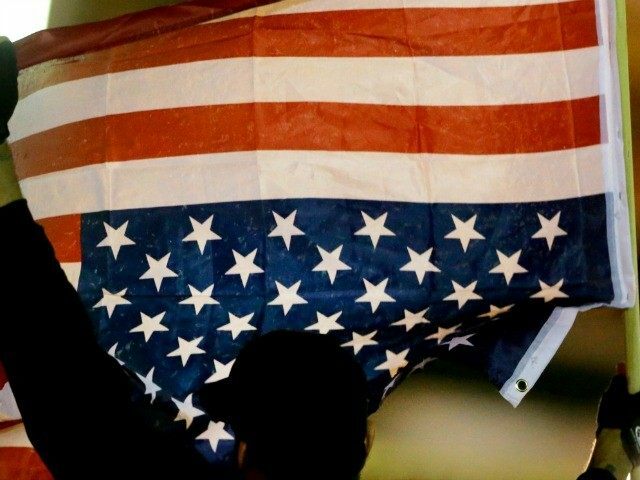 IRVINE, California — Students at the University of California Irvine (UCI) spoke to Breitbart News Sunday, sharing their shock and disappointment at recent legislation by six members of UCI’s Associated Students (ASUCI) to remove an American flag from their building’s lobby this past Thursday. A student who spoke with Breitbart News on condition of anonymity that she heard a member of the ASUCI discussing “the [American] flag and how it triggered people.” She then said she believed a major line of reasoning behind the legislation to remove the flag could have been a “precautionary step” to prevent a trigger situation where if someone is an “illegal citizen or [they] have citizenship issues, it makes them feel bad. “But me and my friends were like, ‘Dude, you’re in America. It’s the American flag,'” she added. UCI student Matthew Guevara, who sits on the Student Association board, authored the resolution (R50-70) to ban the U.S. flag from the association’s lobby wall. The resolution passed narrowly on Thursday in a 6-4 vote in favor, with two abstentions, but was overturned and vetoed on Saturday during a private meeting held by the Associated Student’s Executive Cabinet by a 4-1 vote. UCI administrators also issued a statement on Saturday following the vote to ban the flag, stating that they do not endorse what they described as a “misguided decision” by a political minority that they claim is not representative of the school nor the broader student body. An anonymous student told Breitbart that the removal of the flag took place “respectfully. They folded it in the military style and wrote a little note saying they didn’t want it up.” However, she said, she and her peers were still shocked..